Captain Meinhard Scherf’s life and death were full of ironies. The first of some 20 Ridgefielders to die in World War II, he was killed by his native country serving his adopted land and doing what he loved best: sailing the seas he was literally born on. 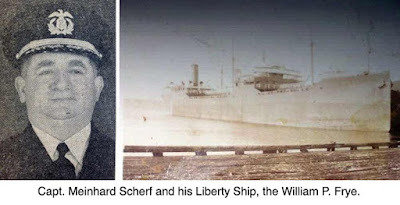 The son of a German Merchant Marine captain, Meinhard Scherf was born in 1893 on a ship during a cruise his parents were taking in the Canary Islands. At 13 he ran away from home in Germany to sign on as a cabin boy aboard a freighter. Just before World War I, his ship docked in Portland, Ore., and he went ashore to visit a friend. When he returned, the ship was gone. The abandoned young man decided to become an American citizen and he soon joined the Merchant Marine. He moved to Ridgefield and Barry Avenue in the 1930s. 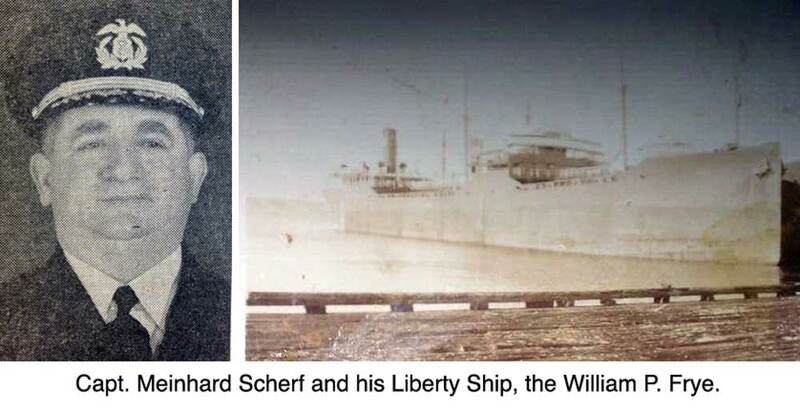 In all, Captain Scherf had spent 37 years at sea when, in February 1943, he took command of the William P. Frye, a brand-new Liberty ship. In a speech at the launching Feb. 11, Captain Scherf said, “As our ships sail all the oceans, bringing supplies and help to our men and to our allies, every American realizes the great value of our Merchant Marine in this war. The Merchant Marine brings weapons to war to those who fight that democracy may live. It brings food to those who fight for us and to the innocent sufferers in a world at war. On its maiden voyage a month later, The Frye was loaded with wheat, 750 tons of explosives, and, on deck, five landing craft, being shipped from Nova Scotia to England. It had 40 crew and 24 Navy guards. The vessel had been built in just three months in Portland, Maine. Like many quickly built Liberty ships, it had problems. A mechanical failure during a hurricane-force gale caused the Frye to stop her engines March 28. As engineers worked on repairs, the ship was a sitting target for U-boats in the area. Seven hours after the Frye stopped, two torpedoes fired from a U-boat in a wolf pack just missed the ship in the heavy seas. Capt. Scherf quickly restarted the engines and zigzaged the Frye to avoid being hit while trying to rejoin his convoy. Unfortunately, on the night of March 29, the ship sailed within view of U-610, sitting on the surface in the darkness. The sub fired two torpedoes, both hitting the Frye, which quickly sank. Captain Scherf and most of the crew and guards were lost. He left a wife, Elsa, and two daughters. Two officers, three crewmen, and two Navy guards survived by climbing into one of the landing craft that had broken free. They spent five days and six nights with only seven carrots for food and no fresh water before being picked up by a British destroyer. Seven months later, U-610 was bombed and sunk in the North Atlantic; all aboard died. In another bit of irony, the William P. Frye was named for the first American vessel sunk by the Germans in World War I.